Charles Kovis, loving husband, wonderful father, brother and friend, and preeminent Moscow criminal defense attorney, died November 11, 2018 of multiple myeloma in Spokane, Washington. Charles (Chuck) was born in Great Falls, Montana in 1951, the son of Jerome Kovis and Florence Redding Kovis. He was raised in Montana, the Territory of Alaska, and Owyhee County, Idaho. After graduating from high school in Marsing, Idaho, he earned a degree in political science in 1973 from the University of Oregon. Following college, Chuck joined the army, serving in Germany for two years. Upon his return to Idaho, he married Erika Schuster, and together they developed and operated a dairy. Chuck also taught high school and for the Job Corps, and worked as a truck driver for Carnation. He and Erika had two children: a daughter, Doree Kovis-Tonks, who lives in Sandpoint, Idaho with her husband Craig; and a son, Dylan Kovis, who lives in Boise, Idaho with his daughter, Zora, Chuck’s granddaughter. Always interested in politics, history, and the law, Chuck decided, in his late 30s, to pull up stakes in southern Idaho and attend law school at the University of Idaho in Moscow. He planned to return to Owyhee County to practice law, but never left Moscow because, he noted, his wife loved the area, and for him it had “trees and liberals!” Chuck and Erika lived in a home in the woods near Deary, Idaho, a place they considered heaven, and there they enjoyed a life complete with horses, rafts, gardening and camping. 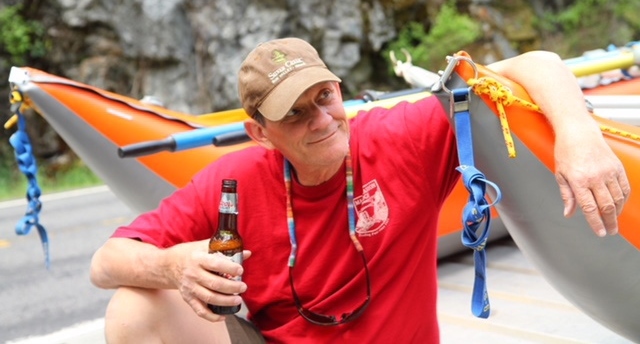 Chuck loved the Idaho outdoors, spending much time skiing with his wife and children, hunting and fishing, and white water rafting on the Lochsa, Clark Fork, and Salmon Rivers. He relished his many trips to Mexico and throughout the West with family, and rafting the Colorado River through the Grand Canyon. Chuck embraced life with great exuberance and was most distressed to be so ill and die so young. Chuck especially loved his work as a lawyer. He practiced criminal law in Idaho and Eastern Washington, working initially with the Knowlton & Miles firm in Lewiston, and then as a sole practitioner in Moscow, combining a private practice with work as a public defender. Colleagues have noted that Chuck’s advocacy was so well-respected that judges often appointed him to represent citizens accused of the most serious of crimes. At one point he won nine felony jury trials in a row. Chuck relished his frequent opportunities to educate judges about the many inequities poor citizens encounter when charged with crimes, his colleague Tim Gresback noted. Other colleagues speak of his formidable advocacy for those who could least afford attorneys: “He worked for many who had difficulties in society and who needed a fairer chance.” Chuck was especially proud of his advocacy in capital cases. Passionate, compassionate, often stubborn, sometimes maddening, Chuck never backed down from a fight, and he could also work a jury and tell a story. Chuck’s work in law was never about money, and sometimes his hotel bill in a case was greater than the fee he collected. A “champion of the law” and a “lawyer’s lawyer,” Chuck labored up until the time his health forced him to stop. Even in hospital he was in frequent contact with those who took over his cases, and he was always interested, always committed, and even in pain he never lost his wit, wisdom or humor. A good man with a good heart, Chuck led a purposeful and meaningful life. In his career, Chuck earned many professional accolades. The Idaho Public Defense Commission recognized his outstanding lifetime achievement in the protection of liberty with its inaugural John Adams Award in 2017. He was awarded the Idaho State Bar Pro Bono Award in 2013, and the ACLU Liberty Award in 2005. He earned the Idaho Association of Criminal Defense Lawyers’ President Award in 2001 and the Gargoyle Award in 1998. Chuck’s friend Jim Siebe exhorts all his colleagues to “exert some extra push back in his memory when you return to work this week.” The family thanks Jim Siebe, Tim Gresback, Megan Marshall, Sunil Ramalingam, Jay Johnson, Joseph Miller, Kent Merica, and others for their perspectives of Chuck’s career, and their support in this sad time. He loved you all and always looked forward to your visits. Chuck is survived by his wife Erika, children Doree and Dylan, and his granddaughter Zora. He is also survived by his brothers, Tom Kovis (Maite) of Battle Mountain, Nevada; and Jerry Kovis of Meadows, Idaho; and by his sister, Mary Kovis of Arlington, Virginia; his nieces, Katie Watson, Jill Whelan, Nika Kovis, Aranxta Kovis; and his nephew, Sawyer Kovis. In addition he has many aunts, uncles, and cousins whose company he enjoyed. He is also survived by his beloved dog, Vanilla. His parents, Jerome and Florence, and his nephew Alex Kovis predeceased him. Chuck’s brothers remember him as a wonderful brother who never forgot where he came from. They hold dear an image of Chuck in the Studabaker Lark he rebuilt with his dad, burning rubber along Sheep Camp Road in Owyhee County. His sister remembers Chuck lovingly attending to his dad, bedridden with cancer, taking many hours from his day as a dairy farmer to assist his dad and mom. His wife and children wish Chuck to be remembered for his absolute love of life. That he is rafting a river somewhere, or sitting on the front porch with his dog, if only in spirit, are lovely and cherished thoughts for them and all of us. The family is planning a celebration of life in the summer of 2019, and will notify friends at a later date. In lieu of flowers, please donate to your favorite charity or to the University Of Idaho School Of Law in Chuck’s name to help a promising student. The family thanks Chuck’s many devoted colleagues and friends for their visits, their words of condolence, and their compassion during this time, and also the staff at Sacred Heart Hospital and St. Joe’s Hospital, both in Spokane, for their dedicated care. A special thanks is extended to Dr. Billy Huang and Dr. Hakan Kaya, for their expertise, kindness, and attention.